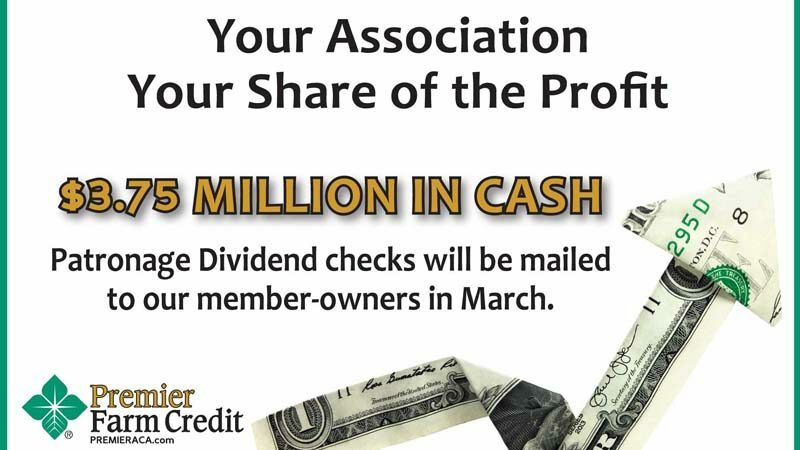 We’re delighted to announce we’ll be mailing $3.75 million in Cash Patronage Dividend checks to our member-owners in March! 2018 is the twenty-first consecutive year Premier Farm Credit will deliver a Cash Patronage Dividend to our member-owners, bringing the total returned during that time to nearly $54 million. We take pride in knowing that our customers are mostly local agricultural producers that conduct a majority of their business in the communities of Northeast Colorado. As a part of the Farm Credit System, established in 1916, Premier Farm Credit offers reliable and consistent credit and related services to agriculture and rural communities, today and tomorrow. Premier Farm Credit is wholly owned by its borrowers and has an aggregate loan volume of nearly $700 million. We have offices in Sterling, Fort Morgan, Yuma and Holyoke, and you can also find us on Facebook, Twitter, LinkedIn or Instagram.